Do you need extra help at home? 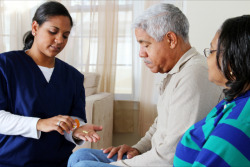 At Ontime Home Health Care Staffing Agency LLC, we are happy to offer Home Services for all of our clients. After all, we understand that there are certain circumstances that may prevent you from completing homemaker tasks. That is why we are more than glad to offer our assistance. Our hard-working caregivers can provide: general cleaning, vacuuming, washing dishes, laundry, ironing, changing beds, cleaning cabinets, caring for house plants, taking out the garbage, gardening, oversee home deliveries and home maintenance, pet care, and more! Allow us to lend you a helping hand today. Get ahold of us by calling 440-353-1012 for more information on Home Services or Personal Care Services in Cleveland, Ohio. If you have a relative, friend, or neighbor who could use our services, please refer them to us now! Click below for additional information.